UNIVERSAL DIN CUTTER Bench top Profile Cutter with five built in dies for manual cutting of common DIN rails to custom length.Tool is intended for use where multiple DIN rails are to be cut without changing the die. • Long Life of Punch and Side Plates. • Nickel – Chrome plated handle. • Cuts in flash and without burr or deformation. 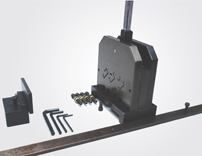 • Guide plate facilitates insertion of profile and provides rail support. • Direct reading rail length indicator (Scale). • Common cutting die for 32/15, 35/7.5, 35/15, 15/5.5 DIN Rails as well as neutral busbars NLS CU 3/10. Description Type Article No. Pkt.